Applied Labels™ - Waterproof sticky labels. 1.5" x 0.5". Clothing Backers - For items with tags, sandwich a Clothing Backer and Applied Label™ together. 1.5" x 0.5". Shoe Shields™ - Clear, protective covers for Applied Labels™. 1.77" x 0.59". Mini Applied Labels™: Ultra small Applied Labels™. Perfect for pens, pencils, glasses, scissors, etc. 0.2" x 0.75" . Orders dispatch within one business day! Label all your supplies and clothes with our personalized and extraordinarily tough label packs. Make sure you avoid the lost-n-found bin this year! Ordering Tip: if an icon is chosen, labels will print with the name as two lines and the icon to the right. The only exception is for very short names (under about 12 characters). Applied Labels™: Apply to a dry and clean surface. Handle the label by the edges to avoid contaminating the adhesive. Place the label and press very firmly, especially on the corners. Shoe Shields™: Apply the name label to the inside, flat heel area of the shoe and press firmly. Center the Shoe Shields™ label over the name label and press firmly. Clothing Backers: Place the blank backer behind the tag, sticky side up. Align the printed label and press, with sticky sides together. Mini Applied Labels™: Apply to a dry and clean surface. Handle the label by the edges to avoid contaminating the adhesive. Place the label and press very firmly, especially on the corners. Note: Labels should be applied by adults. Periodically inspect and replace any labels that appear to be lifting. Our school label packs are perfectly designed to help you label all the things that your child brings to school. 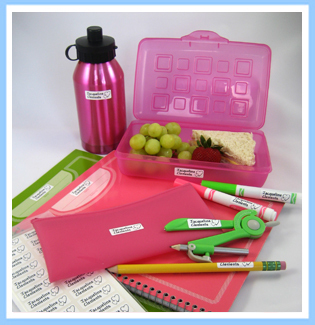 The school label pack includes personalized Classic Applied Labels™ along with other neat labeling accessories. The accessories turn our dishwasher-safe name labels into labels that also work on clothing with tags and also in shoes. No more ordering a million different types of school labels. You can now quickly and easily label lunches, those expensive winter coats, school supplies and shoes, all with the school label pack from Applied Labels LLC. Our school labels provides you with flexible and versatility to label the items you need. That adds value! You can also add a sheet of mini school labels. They are super small labels and super adorable too. They are perfect for crayons, markers, pens, pencils, sharpeners, scissors and much more. You get plenty of mini labels per sheet so you can label just and anything for school. You can personalize your school labels with your choice of font and icon. You even add a second line of text to your labels. Labels for School - Not only are our labels great, but so is our service. We dispatch orders within one business day, so you get your labels quickly and in time for school. Applied Labels LLC – Offers the best back to school label packs!